Perhaps because we were all born from water, in the amniotic fluid in which we float at the beginning of our life; or perhaps because the first living beings, the unicellular organisms that populated the earth, developed in the water; or perhaps again because in most foundation myths water returns as a driving element from which the birth of the known world proceeds. Whatever the reason, in the water resides an ancestral creative energy that drives the hand and the heart of artists. It enchant the mind of philosophers and arouse the intuition of scientists and researchers. 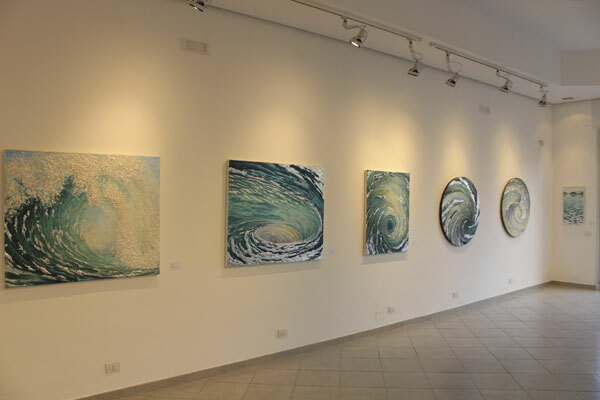 Emilio Alberti seems to be able to take water by the hand, dialogue with it and then tell the story: a story made of impetuous waterfalls and small stones thrown into the tranquil lakes, of ricochets of drops and vortices, of storm and stillness. Perennial and transient, ductile and persistent, powerful and, today more than ever, in need of protection, water is also witness of harmonious coexistence between opposites, a symbol of perseverance and impermanence. 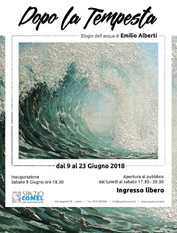 Tempesta (Storm) is the work with which Emilio Alberti won the Audience Award of the Comel Award 2017, probably the most appropriate prize for a work centered on our common good. The water on the artist's canvas has found assonance and response in the observers' sight, allowing everyone to find themselves in the suspension of a drop before plunging into the roar of the storm. 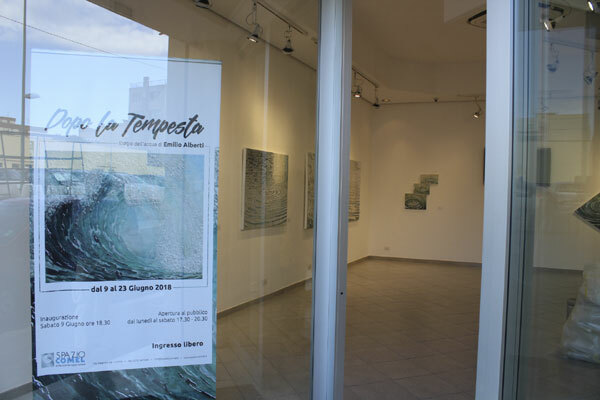 The exhibition at Spazio Comel, whose title is "Dopo la Tempesta" (After the Storm),showcases a series of works on water, from which the unmistakable hand of the artist stands out, along with the result of his research on the interaction between materials. From the two-dimensionality of the painted canvas the artist reaches the three-dimensionality of the sculpture with the use of stuccos often covered with aluminum. The effect is that color opens up to leave room for the material which in turn enters into dialogue with the light thanks to the metallic glows.Water, the subject of the works, is represented by a skilful use of mineral elements, as if to reveal the secrets of its mixture enclosed into the transparency of a drop.